Everyone faces emotional challenges. Everyone deals with stress, and everyone goes through ups and downs. But for some people, those challenges, those ups and downs, and that stress is tougher to deal with. How can you tell if someone is just going through a tough time, or if they are on the verge of harming themselves? If a friend or loved one is making it clear that he or she is thinking about committing suicide, reach out for help immediately. If the threat is imminent (likely to happen soon) you should call 9-1-1. If you are in Western New York, you can also call crisis services at (716) 834-3131. If you’re not in this area, another resource is the National Suicide Prevention Lifeline at 1-800-273-TALK (8255) where you can find out what resources are immediately available in your area. You can also take the person to the nearest emergency room. Depression is the number one cause of suicide, often because of the feelings of helplessness it causes. It can warp people’s perspectives and ways of thinking, where they might not be able to see that a crisis is temporary or their pain is treatable. Be willing to listen to what the person has to say. Allow them to express their feelings and tell them you accept their feelings. Avoid being judgmental. 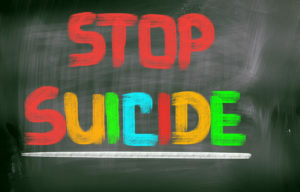 Don’t argue whether suicide is right or wrong or whether their feelings are valid. Show interest and support; don’t brush the person off. Try not to act shocked—this may put distance between you or make them withdraw. Offer hope and encourage them to seek treatment. Share the suicide hotline number. Take action, if necessary—remove weapons, such as guns or knives, or pills or poisons. If you notice the person saying goodbyes to people or giving away personal possessions, if you hear him or her glorifying or glamorizing death, or if they are talking about where to get access to pills or weapons, these are also serious warning signs that something is wrong. Even if you’re just concerned that your friend or loved one isn’t quite themselves, or may be struggling with an issue that may be more serious than they can handle, you can offer support easily. Pick up the phone, send a text or a Facebook message, pay a visit, or make plans to see them. Let them know they’re on your mind, and they will know they’re important to you. If you have more questions, you can call the National Suicide Prevention Lifeline or contact a local mental health professional. In Western New York, call Horizon Health Services at(716) 831-1800 to be connected to a person who can help.